It’s hard to imagine a better way to celebrate the start of summer than by joining 50,000 friends and fellow country music fans for a star-studded music festival with an ocean view. That’s exactly what’s on tap June 7-10, 2018, on the Myrtle Beach, South Carolina, oceanfront — and booking your stay at Bay View on the Boardwalk early will guarantee your spot and give you super-easy access to all the action. Back in 2018 for a fourth straight year, the Carolina Country Music Fest — the largest three-day outdoor country music festival on the East Coast — celebrates a pair of great American traditions: country music and fun at the beach. This year’s affair will feature more than 30 of the top names in country music, and megastars Luke Bryan, Toby Keith and the Zac Brown Band will lead the charge! More acts will be announced soon, so stay tuned. To sweeten the deal, Bay View on the Boardwalk is offering savings of up to 40 percent on oceanfront accommodations with first-class amenities during the festival, as well as discounted tickets to the event. All together, it makes for a great way to jump-start your summer and the perfect place to spend your time before and after the CCMF shows. Click here to learn more about Bay View on the Boardwalk’s great offers — and act fast, because these deals will only be available for a limited time. 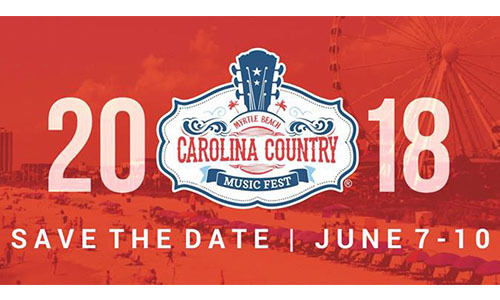 Held on the former Myrtle Beach Pavilion amusement park grounds — on a site boasting 18 coastal acres that stretch from the Myrtle Beach Boardwalk to North Kings Highway — the Carolina Country Music Fest features a three-day lineup of live music on three stages, with concession stands and vendor booths set up throughout the complex, VIP areas, and more. Extras such as an on-site zip line round out the festival’s fun attractions, and the laid-back, oceanfront atmosphere allows attendees to kick back and relax on a beach blanket, enjoy a cold beverage of choice, and take in the sounds of their favorite country music artists. Guests at Bay View on the Boardwalk are in the perfect spot to enjoy all the action — the resort is less than half a mile from the concert venue, so a short walk down the beach, boardwalk or boulevard is the only thing separating them from all the action. They can also catch a shuttle to and from the concert grounds before and after the shows. To top all that off, before guests head to the fairgrounds and when they get back, they can rest up in our clean and comfortable accommodations, splash around in our indoor and outdoor water features, and enjoy their private balconies overlooking the Atlantic Ocean. To start the day on the right foot, guests can head to the on-site Starbucks for coffee and pastries. Also, the Atlantic Ocean and its white-sand beach is located just steps away from guests’ rooms, and with the Myrtle Beach Boardwalk in the resort’s backyard, more great dining and shopping options are within easy walking distance. The CCMF festivities will begin with the McDonald’s Kick-Off Concert on Thursday, June 7, at 6 p.m., then the action kicks into high gear on Friday, Saturday and Sunday, June 8-10, with three full days of music. On all three full festival days, live performances run from 1 to 11:30 p.m. on the three fairgrounds stages. Attendees can purchase general-admission and VIP passes for admission, and fans are encouraged to bring beach blankets for seating. Learn more about the festival at carolinacountrymusicfest.com. For a fourth straight year, Bay View on the Boardwalk is ready to rock into the summer with the the Carolina Country Music Fest. Book your trip early here to secure your spot and join the country music fun in the sun!